What are the best landscape plants for play and learning? Building on the above quote, this article provides a crash course in understanding the role of plants in children’s environments. There are many publications that deal with planting design theory but few that deal specifically with the benefits of plants in children’s environments. NLI hopes to spark an interest in installing plants for children’s spaces. The most important function is the ability of plants to enrich the experience in the natural world of a child where plants provide sensory stimulation, produce shade, and attract interesting visitors from the animal kingdom. As adults, we know that plants provide shade, visual screens, and wind barriers, but to children plants create a magical world where imaginations can endlessly roam. Leaves and other natural loose parts become toys and props. Indoor curricular activities can be taken outside where science, math, art, and literature can be learned through interactions with nature. Plants make it possible for outdoor games like hide-and-go-seek to promote higher levels of physical activity. Providing the opportunity for these experiences requires adults to put themselves in the mind of a child, looking for those extra special qualities that plants can bring to outdoor play and learning. Basic differences exist between types of plants: Evergreen plants keep their leaves all year and deciduous plants lose their leaves each year. Perennial plants come back every year and annual plants do not. These basic differences are the foundation for plant selection decisions. Here are some examples of how these basic differences impact decision making: Evergreen trees provide shade year round. Is that a positive quality in your space? Do you want shade in the winter, or only in the summer? Annual plants provide instant color, but die every year. They provide great opportunities for children to get involved in planting, but areas of annuals should be limited to aviod re-planting the entire space every year. These basic considerations can help in the plant selection process. 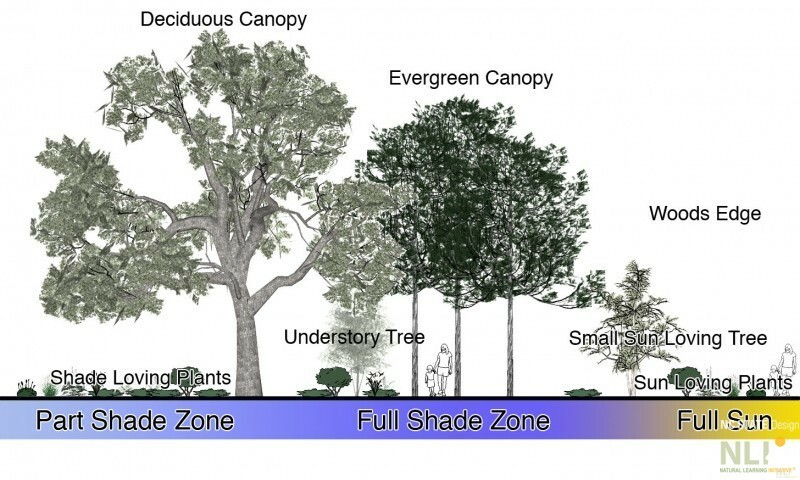 Trees – mainly for shade and as visual screens. Some are good for climbing! Shrubs – flowering or purely “greenery” and many species attract butterflies and other pollinators. Vines – perfect for planting on arbors and fences, some have edible fruits. Ornamental grasses – tough affordable plants can take lots of foot traffic. Groundcovers – plants that can be used instead of mulch or sand to cover large areas. Herbs – special plants that can introduce new scents and tastes to the landscape. Some can be used as groundcovers. Perennial flowering plants – beautiful and intricate flowers that come back every year. Annual flowering plants – this type of plant is re-planted every year and kids can get involved. Right Plant, Right Place: Where do plants want to live? Plants are engineered by nature to survive in specific environments. Horticulture, the science of growing plants, provides us with plants that have been selected from nature to thrive in conditions that we prepare. Knowing some basics about how plants relate to each other and grow as a unit can help with understanding how to put the right plant in the right place. There are many factors that contribute to a successful planting effort where all of the plants continue to grow and thrive. 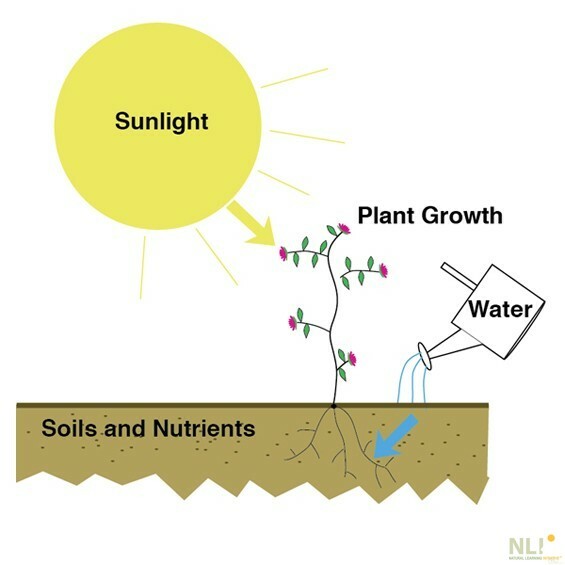 The diagrams below illustrate the essential needs of plants and identify the basic sun/shade conditions that plants need to survive.